For winning performance every detail counts. Precision Jet Drive billet impellers feature space-age race-proven technology, 100% aircraft materials and quality control specs, the state-of-the-art design and CNC machining make the difference every time. Fits: American Turbine, Berkeley, Dominator, Legend, Aggressor. For more info click here ! Billet 1018 or 8620 Steel Impeller. Three Time White Water Racing World Class Champion. Precision Jet Drive billet impellers feature space-age race-proven technology, 100% aircraft materials and quality control specs, the state-of-the-art design and CNC machining make the difference every time. The Inducer is a revolutionary concept Designed in the 50's for the use in rocket fuel pumps. it can keep the turbine pump impeller supplied with 20% more water then it can pull in by it self, this in turn putting all the produced power into motion. Increase's pump life. Improves: hole shots, faster pop-ups of water skiers, thrusting of heavy vessels, River & Drag Racing. 100% CNC machined from a solid stainless steel bar, Not From a casting. 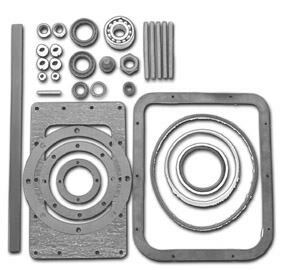 Fits: Any turbine pump land base or Jet Drive unit with little machine work. Click for History on inducers ! Manufacturing or Dealer Inquirers Welcome ! Made of aluminum-Bronze CNC machined. Rebuild Kit - without impeller. Available for Berkeley, Dominator, Legend, American Turbine, Aggressor, and choice of standard or undersize aluminum bronze shouldered wear ring. Rebuild Kit - with impeller. 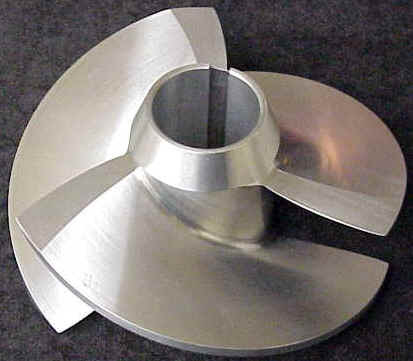 Available for Berkeley, Dominator, Legend, American Turbine, Aggressor, and choice of impeller size. 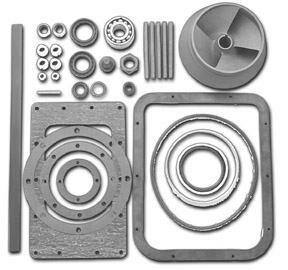 kits feature OEM cast aluminum impeller.